Been meaning to post this for a while. These are neighboring buildings at the intersection of Smith St and Atlantic Av in Brooklyn (40 41’19.2″ N, 73 59’21.6″ W, says the iPhone). The building on the left is a “luxury” high-rise, advertising “prime retail” on the ground floor. The building on the right is a city jail. It was out of use from 2003 to 2008, but the city is gradually filling it up again. One can’t say the same of the condo, which is all empty. It’s one of the disastrous properties developed by Shaya Boymelgreen, one of the more spectacular failures from the bubble years. Apparently the hope was that the city would turn the jail into condos too, but that didn’t happen. Maybe they can turn the condos into a jail! 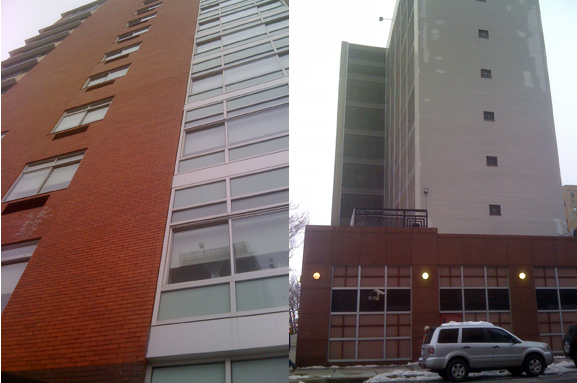 I’m sorry Doug but the condo would have to have its windows bricked over for them to turn it into a jail. That or thick steel bars put in, and razor wire coils wrapped around on the outside, and the non-load bearing walls would have to be reinforced so that nobody could mash a hole in one* and slip out down the hallways. I’m not advocating for any of this, but that’s how prisons/jails are designed to both immiserate and block escape. * In El Cajon, CA., the city built a tall jail in the center of town in the early 1980s and they used lightweight filler in the walls. Prisoners found out, and began tunneling out to freedom. The jail is now used as a courthouse/police HQ. Mr. Westrich, that’s pretty much what they built in El Cajon, but it was semi-octagonal….looked more like a corporate office than a jail, but the lack of windows (except for a strip on the 9th or 10th floor) was a dead giveaway. Well thank goodness the city is filling that jail up again ! Maybe the closed schools in Detroit and KC can be used in such a manner, as well. The public sector needs to think creatively in these tough times, because we all* need to tighten our belts a little. Great interviews with Steffie Wohlhandler (sp?) and Tom Athanasiou (sp?). Two Large Issues, quite different, yet the discussions were true to the highest ideals of informed skepticism, US-style. Okay, end of fan letter. Now to the edgy question – why do folks refer to you as a “Marxist economist”? In LBO and BTN, I hear and read, what, at most a whiff, not even that, of the jargon – and I’m more than content with that. Would you accept “post-Marxist”? Can we give a nod to the old boy for being a sage of those early times, and then move on to our brave new dystopia with our language freed up?